Sunshine Through the Rain: It's summer, and time to thank the teachers! It's summer, and time to thank the teachers! 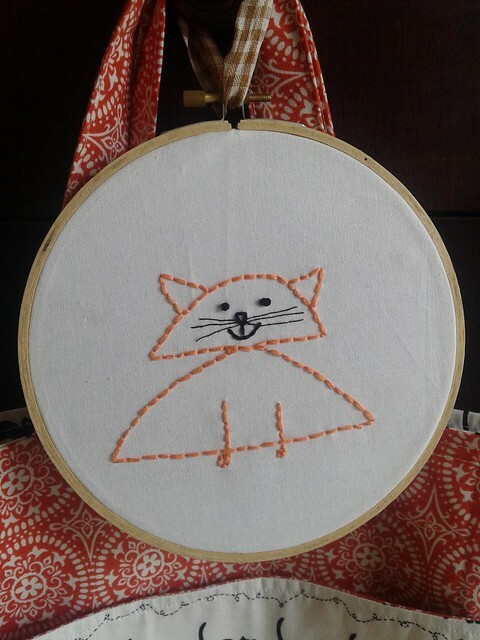 With only one son in Elementary school this year, we just had one teachers gift to make, and Mr. 8 knew exactly what his teacher likes - cats! I helped with the eyes and whiskers, but otherwise he did an amazing job by himself. 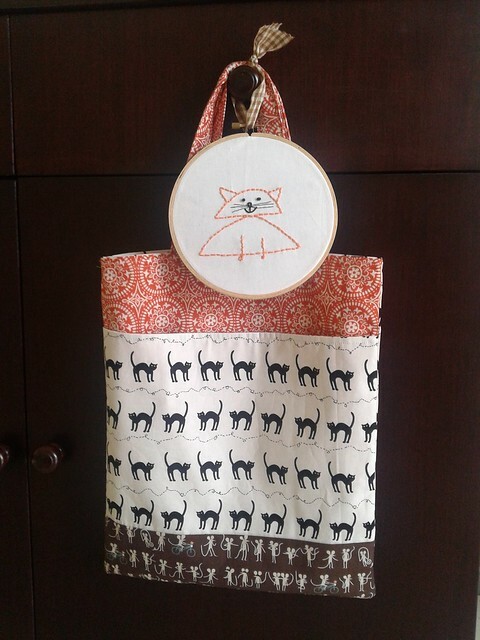 The original plan was to incorporate the embroidery into a bag, but we decided that it looked so cute by itself in a hoop, and so I finished it off with felt on the back and a ribbon to hang it by. 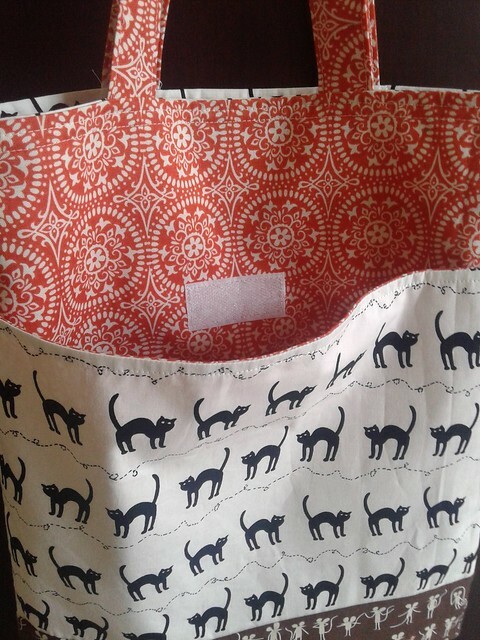 For the tote bag we chose some cat fabric, and then Mr. 8 chose some other fabrics to match, including cute Lizzy House mice! 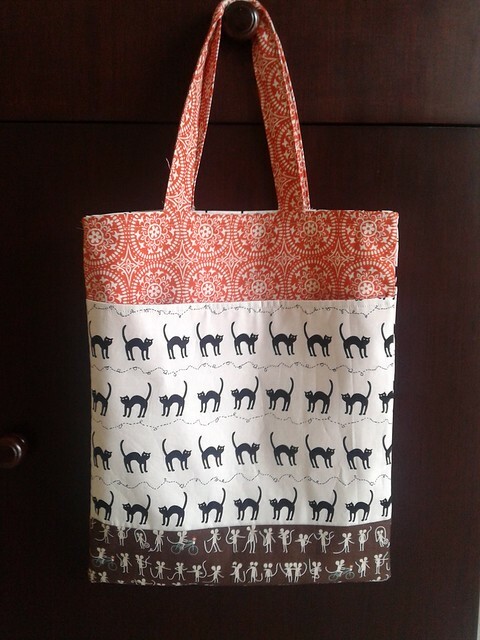 I made the tote, following Svetlana's great tutorial. The only changes I made were to make my own handles, and to apply a piece of velcro on the front pocket. His teacher was thrilled with the presents, and it was nice to make something extra special for her as she is leaving the school and returning to the USA. He did a fabulous job with his embroidery! I used to teach my 6th graders to embroider and many of my boys had the most precise and accurate stitches. I am sure the teachers was thrilled and will cherish the gifts forever. Of course the teacher was thrilled!! These are wonderful gifts!! The stiched cat is so cute, and such perfect stitches. I love the mouse fabric used with the cat fabric, very cute! Wow! You both did a great job! She will be so happy. What a delightful gift Deborah! I'm guessing the teacher was thrilled! I would be ! I love that you put the cat fabric with the mouse fabric! ( I was wondering whether they from the same range?) I did a similar thing with my "Melbourne Town" piecing this week- I have the foxes looking at the sheep nearby! Both gifts are excellent - useful and have had input from your son. No wonder she was pleased. Seems your school there run to US holidays. Enjoy. This is just such a lovely gift. Thoughtful and generous. I would imagine the teacher is going to be stoked! really, really sweet gift! i love the combination of fabrics on the tote. nicely done! Fab present! Love the mice and cats used together at the same time! He did a great job on the cat - well done! I think these are adorable, but the fact that Mr 8 got involved and made part of the present himself makes them even better. What a pretty tote and cute embroidery! Hi I'm Deborah. I am an English girl, married to an Aussie and we are currently living in Indonesia. I am a mum to two wonderful boys. I discovered a love for fabric and quilting in 2012 and now am hooked! Sewing fear number two ... conquered!